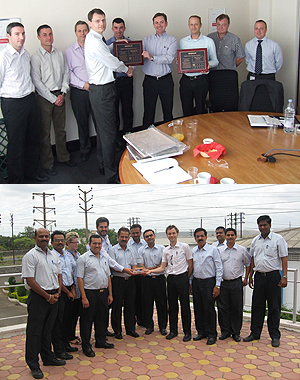 Haldex Concentric, the leading supplier of diesel engine pumps has been awarded Caterpillar's prestigious Supplier Quality Excellence Process (SQEP) bronze award in its UK, USA and Indian factories. Caterpillar's SQEP program is designed to place special emphasis on supplier performance excellence and certification is awarded only to suppliers that have achieved the highest levels of quality, delivery, process control, and six-sigma. David Woolley, Managing Director of Haldex Concentric in the UK and India, received the award from Julian Fenner, Category Purchasing Manager at Caterpillar. There were separate award ceremonies at the company's plants in Birmingham, Pune and Itasca, Illinois. Mr. Woolley commented: "SQEP is extremely rigorous and requires us to demonstrate our process control capability and 6 Sigma discipline in driving continuous improvement. Achieving SQEP certification is a measure of our absolute commitment to world-class capability and global support to our customers. It is also a fitting tribute to the excellence and commitment of our workforce on three continents." Haldex Concentric, has been a major supplier to Caterpillar and Perkins for over 20 years and is among the first UK suppliers to achieve the certification. The company currently manufactures pumps for Caterpillar's C7 and C9 engines. The award coincided with another significant milestone for the company when it achieved the silver level of the Haldex Way continuous improvement process on the first occasion it was assessed since joining the group. The Haldex Way is a formal continuous improvement programme by which all Haldex divisions are measured according to a multi-tiered achievement structure. It is founded on three core values: "customer first", respect for the individual and elimination of waste. The Haldex working environment deals in real time, emphasizes simplicity and consistency. Teams focus on processes and work continuously towards identifying the root cause of variations and acting on the basis of facts. All are encouraged to challenge results in an open and honest environment. Leadership is supportive, participative and builds on developing relationships. Haldex Concentric has been part of Haldex AB in February 2008 and is now incorporated in the Engine Business Unit of the group's Hydraulics Division. The unit is a major supplier to the worlds truck, agricultural and construction equipment industries, with manufacturing facilities in Germany, Sweden, the USA, China and India as well as at the divisional headquarters in Birmingham, UK. In addition to oil, fuel and water pumps for diesel engines, Haldex Concentric manufactures the Alfdex air/oil separator, Varivent EGR accelerator, integrated front cover assemblies and lubrication pumps for transmissions and reciprocating compressors.